Home › Uncategorized › Russian Easter Ball on April 9, 2010 almost SOLD OUT! …..Mike Weir, Tretiak and Olympic Hockey Gold winner Pronger memorabilia to be auctioned. Russian Easter Ball on April 9, 2010 almost SOLD OUT! …..Mike Weir, Tretiak and Olympic Hockey Gold winner Pronger memorabilia to be auctioned. Shake off your winter coat – it’s PASCHA…and time to celebrate at the EVENT OF THE YEAR – The RUSSIAN EASTER BALL! Featuring the MISHA SMIRNOV ORCHESTRA – BARYNYA from NEW YORK, performances by KANTEMIROV’S WONDERFUL WORLD OF CIRCUS, Champagne reception and a fine Easter feast, Silent Auction and more! · Hockey Jersey signed by Chris Pronger, fresh from the 2010 Olympic Gold Medal Team Canada win! Here is your chance to buy a piece of history and help a very worthy cause! · And for the Golfers……a Masters’ Golf Tournament Pin Flag signed by MIKE WEIR! 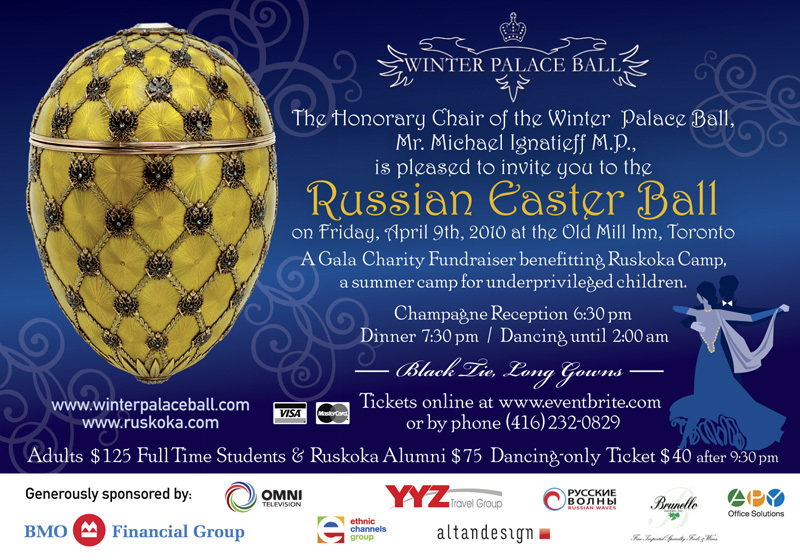 The Winter Palace Ball raises funds for Ruskoka Camp – a registered charity and summer camp in the Muskokas for disadvantaged children, mostly of recent immigrants from Russia and Ukraine. The camp is run by volunteers, and supported entirely by donations. Your support is vital! Click here to see photos of the last year’s event from Maclean’s Magazine. A tax receipt will be issued for the donation portion of the ticket. ‹ Passing of Ronald Meyer. Eternal Memory!